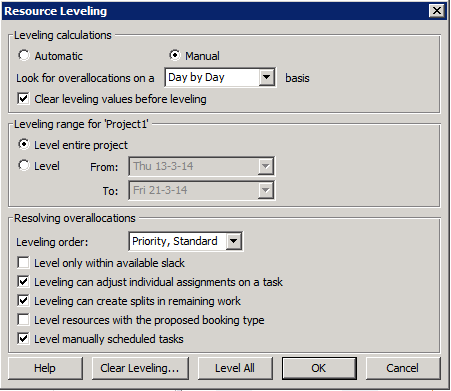 Next to the regular scheduling options (constraints, dependencies) and the leveling algorithm, it is important to discuss the resource leveling options. What are the ideal setting for the leveling options screen? These settings are personal, so you can choose to deviate from the default settings where you prefer. In this image you see our preferred settings. What are your preferred and personal setting in the resource leveling screen? Share it in the comments below. ← How to see if leveling resources has impacted your schedule? → How to determine when costs are ‘actual’?